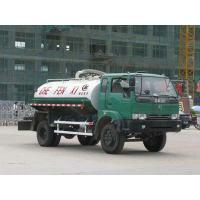 Transport medium : liquid dirt and feces , density: 800 kg / cubic meter. Effective tank volume: 5.51 m3 ; tank dimensions ( length * long axis * short axis ) (mm): 3600 * 1900 * 1200. With the optional chassis cab. Protective Material : Q235 carbon steel connections : left and right side and rear underrun protection of welded connections, rear protective section size (mm): 360 * 50 * 5, rear protective ground clearance (mm): 510. EQ3093GD4JAC Dongfeng Dump Truck Chassis II Dongfeng Automobile Co., Ltd.